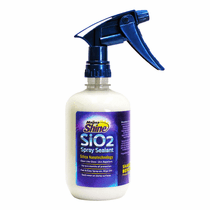 Magna Shine SiO2Spray Sealant is a revolutionary silica nanotechnology formula that offers up to six months of protection in an easy to use spray on, wipe off application. The Magna Shine SiO2 Spray Sealant leaves your finish with a high gloss glass like finish that repels dirt. Thoroughly wash and dry your vehicle prior to application. Be sure that surface is clean and free of solvents or waxes. Magna Shine SiO2 Spray Sealant may be applied over Magna Shine Ceramakote Protective Ceramic Coating or other ceramic coatings.